Brew yourself the perfect wedding batch by adding hops into your decor. 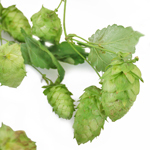 Heaps of Hops Vine provides a full vine of clustered fresh, green buds to decorate your venue with. Shorten the length and place on banquet tables for added interest or remove the individual buds and fill up vases to the rim with the aromatic buds. Pair hops with greenery for the groomsmen boutonnieres and add in a bridal bouquet for a quenchable textured filler interest. 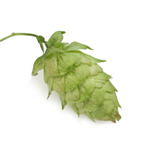 Bulk Hops is available Mid July through Mid September. 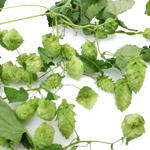 Hops are shipped in a large strand with clustered hop blooms throughout. The density of hop buds depends on the time of the harvest. Hops will shed. It is completely normal for up to 20% of the buds to fall off over time. Fresh Hops last an average of 7 days with proper care and handling. Hop buds can be dried out for décor. FiftyFlowers Hops are commercially grown for decoration purposes and not for consumption. Greenery is shipped directly from our farms. Before shipping your greenery, we prepare them for shipment with proper hydration methods. It is absolutely NORMAL if your greenery appears sleepy and thirsty after their journey. Ensure that your flower buckets are clean and disinfected. Fill the buckets with at least 4 inches of fresh, cool water. If you have flower food follow the instructions on the packet to prepare your water. Remove greenery from box by cutting any straps. Remove any stem bunch packaging material, including plastic sleeve and/or newspaper. Cut stems diagonally under running water with sharp scissors to desired length. Remove any foliage that lies below the water line to prevent bacteria from entering through the water. Immediately after cutting, place the stems in the prepared buckets. Ensure that you have sufficient room in each bucket for the amount of stems you will be storing. Overstuffing may cause damage to stems and leaves. Allow greenery at least 4 hours to hydrate well. Greenery may take up to 12 hours to properly hydrate. Keep greenery in a cool room, away from direct sunlight, drafts or excessive heat. Change water every 24 hours to keep greenery fresh. Be sure that your stems have sufficient water. The flowers will drink an exceptional amount of water upon arrival. * If upon first inspection, you foresee a problem with your greenery, do not proceed processing your order. Leave the greenery intact in the box and call us immediately at 1-877-50 ROSES (507-6737).